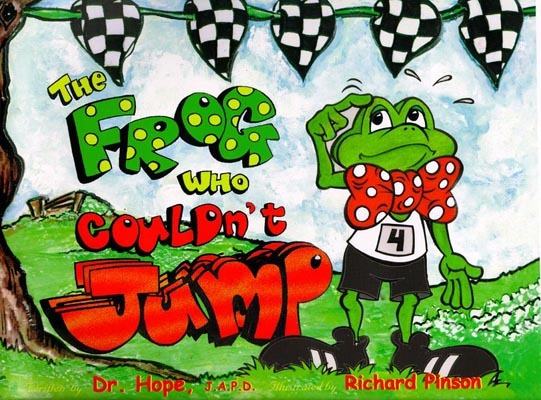 Freddie Frog has a problem: he can't jump and no one will let him play Jumpaloo. 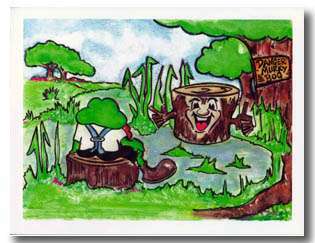 A wise stump tells him he should look for a teacher and that's how Freddie's adventure starts. After searching he finally finds a teacher and through his private practice sessions improves immensely. Along the way Freddie learns that striving for a personal best has rewards greater than winning first prize. 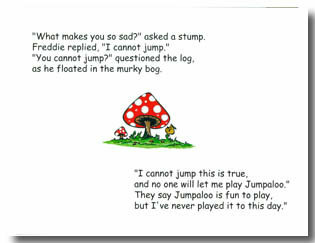 In spite of laughter and ridicule from others Freddie decides to enter the Great Jumpaloo contest. He sets a new record but then something surprising happens. Secret Phrase: #11 "a helping hand"